Visitor Question: I attended the meeting of my city's planning commission the other night. I am trying to get appointed to the commission. At one point there was some conversation about the need to meet consistency requirements. I did not understand the reference. Is this common? 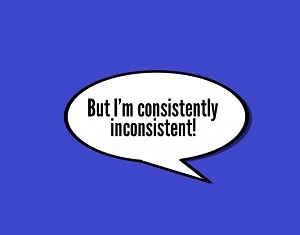 What must be consistent with what? The mayor attended the meeting and was asked to comment. She seemed to hate the fact that there might be consistency requirements. Editors' Reply: There are three common ways that the term is used in planning circles in the U.S. We will describe each, but there may be even other types of consistency requirements in use. So you may have to ask more questions locally, but at least we can give you some definitions to explore. Probably most commonly, the term consistency requirements refers to the fact that in many states, state law says that zoning is required to be in conformance with the comprehensive plan. Other synonyms for the comprehensive plan are master plan and the older term general plan. Some places are very strict about this, to the point that if the plan commission and city or county council see merit in a rezoning petition, but granting the petition would not be consistent with the land use plan or land use element (chapter) of the comprehensive plan, the council will vote first to change the comprehensive plan and only then vote on the rezoning proposal. In other states, by law or by custom, the requirement or suggestion for zoning to be consistent with the comp plan is taken more lightly, and interpreted more generally. Just to complicate matters, sometimes the state law does not require a municipality, county, or township to even have a comprehensive plan or land use plan in order to exercise the option to zone land. Zoning is seen (correctly) as an exercise of what is called police power, even though no police persons are involved. To summarize what we said thus far, it could be that your state's consistency requirements pertain to an obligation on the part of the city, town, village, or county to zone land consistently with what the land use plan envisions for that particular parcel. So your mayor could have been expressing displeasure with the lack of flexibility to zone in a way that makes sense for the particular instance. The second major possibility is that the discussion was a broader one. Sometimes states require that the most local jurisdiction's plan must be consistent with the plan of local governments or entities larger than the jurisdiction. For example, a town's comprehensive plan might be required to be consistent with, or made consistent with, the plan of its county. A county might be required to write a plan that is found consistent with a state plan, as occurred in Florida in the last century. So the second type of consistency requirements in America right now are requirements that one level of government plan in a way that is consistent with other levels of government. Yet another type of consistency requirements deals with specific planning-related regulations or approvals. Our best example of this may be Florida, but other states have less focused versions of the same thing. Certainly courts frequently take this common sense stance as well. Examples help. If your comprehensive plan says that you preserve all buildings placed on your local historic registry, and yet your plan commission and city council decide to approve a development plan that includes the demolition of a listed historic structure, your jurisdiction would not meet a consistency requirement, if one is in effect in your state. Another example pertains to the development regulations or to the district regulations in the zoning ordinance. For instance, if there is a state consistency requirement, a zoning ordinance requiring the provision of off-street parking spaces in front of all stores would not be consistent with a comprehensive plan stating a goal of preservation of the historic downtown and its configuration of buildings adjacent to the sidewalk. So you see there are several possible meanings, and more than one may well be in effect in a particular location. In that case you may have to rely on context to determine which consistency requirement is being addressed. Join in and write your own page! It's easy to do. How? Simply click here to return to Planning Terms Question.